J-84 Restrike. These popular and rare Gobrecht dollars were struck between June 1859 and 1863. They were struck on orders of Mint Director James Ross Snowden as trade pieces for rare Washingtonia needed for the Mint Cabinet Collection. To date, only two Original 1838 Gobrecht dollars are known, one is in the Smithsonian and the other in the ANS. Thus, collectors assembling a date set of Gobrecht dollars must seek a Restrike of this rare date. 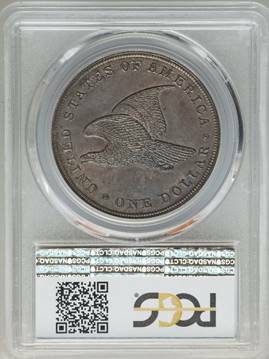 In hand, this coin is much more colorful and attractive than seen in our images The PCGS population is only six with none graded higher. 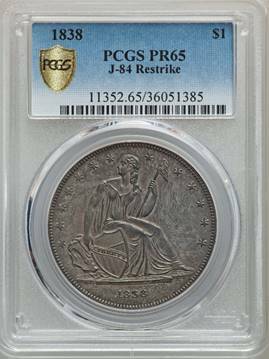 Listed at $145,000 in the PCGS price guide.